An engineering feat 135 years old, the 71-mile High Line Canal (Canal) has delivered irrigation water from the foothills of the Rocky Mountains to the dry prairie since 1883. Flash forward to today, the Canal is outliving its life as an irrigation channel and has taken on new existence as a recreational and ecological resource for the region’s growing population, with over 500,000 visitors per year. With increased trail use, an aging tree population and scarce water supplies in the West, comprehensive care of one of its most beloved assets – the tree canopy – is now a top priority. The High Line Canal Conservancy (Conservancy), along with its partners Denver Water and the adjacent jurisdictions, are collaboratively taking action to maintain and revitalize the tree canopy. 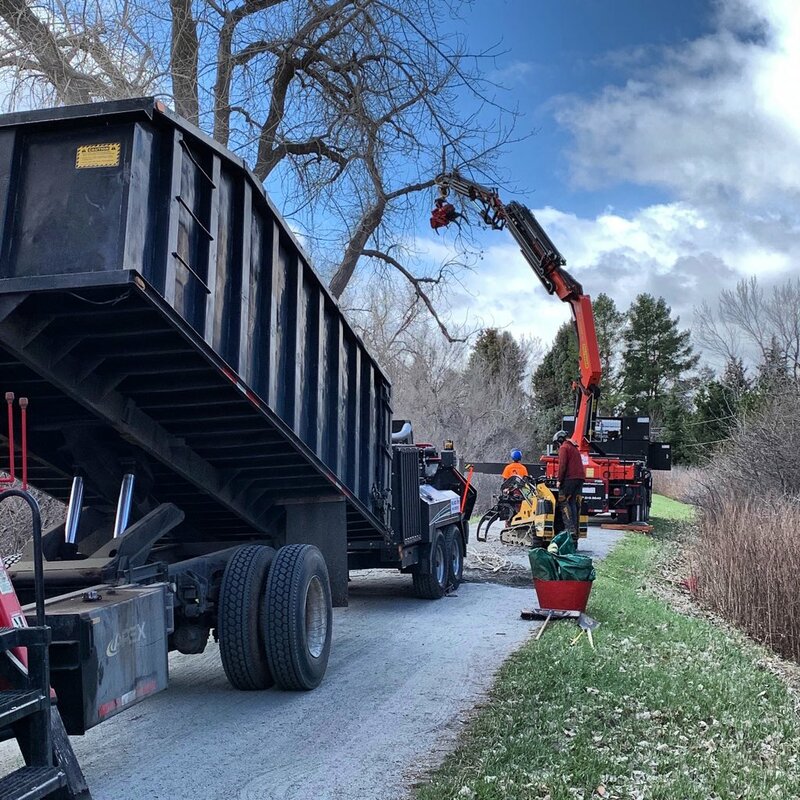 This June marks the initiation of a multi-year tree maintenance program – part of the Tree Canopy Care Project – that prioritizes safety for recreational users and the long-term health of the tree canopy. This significant, 71-mile-long project is only possible with the commitment of the Conservancy and partners’ joint funding, staff and expertise. Expected to take over two years, it coincides with the Conservancy’s 2018 planning efforts to develop a Framework Plan that will establish appropriate pruning and healthy planting standards for the Canal. What: Comprehensive 71-mile tree care plan includes initial two- to three-year maintenance work and landscape design guidelines for future plantings. Immediate first steps prioritize safety for recreational users and adjacent property owners and the most pressing tree health issues. Who: The High Line Canal Conservancy and partners, Denver Water and the jurisdictions along the Canal’s reach (Aurora, Arapahoe County, Centennial, Cherry Hills Village, Denver, Douglas County, Greenwood Village, Highlands Ranch, Littleton and South Suburban Parks & Recreation District), have collaborated to initiate this comprehensive project. How: Joint investment through funding, staff and expertise between the Conservancy and partners has made this Tree Canopy Care Project possible. Why: Continuous care and maintenance is required in order to extend the life of the tree canopy and ensure a safe and vibrant trail corridor. Many trees, especially Cottonwoods, are completing their lifespan as the Canal reaches 150 years. Changing times have demanded new, creative ways of thinking in order to preserve the natural qualities of the Canal, while also being responsible water stewards. Where: A 2016 tree inventory recorded nearly 24,000 trees greater than six inches in diameter along the 71-mile Canal. This data was used to identify high-priority trees in need of care in all areas along the corridor. Tree care and maintenance will begin in Aurora and Douglas County, moving into all five character zones. Background: The Community wrote the Vision, the Conservancy brings it to life! During 2016 and 2017, the High Line Canal Conservancy embarked on an unprecedented public outreach effort, engaging more than 3,500 members of the 11 unique communities along the Canal’s 71-mile corridor. The result – the Community Vision Plan for the High Line Canal – serves as the foundation for future design and planning efforts for the Canal and outlines guiding principles that the Canal remain a natural, connected and continuous, varied, managed and enhanced resource for the region. Representing an important shared investment in the Canal, the Conservancy, Denver Water and the jurisdictions have together taken steps to implement the community’s vision to foster the Canal’s natural qualities by initiating a comprehensive tree-care plan for all 71 miles. Building on this community-driven plan, the Conservancy is moving forward to develop a Framework Plan that includes a comprehensive set of landscape design guidelines that will provide guidance to the tree care project to foster a healthy and safe tree canopy. Planning is underway and the Framework Plan is expected to be complete by the close of 2018, however, work has already begun on the ground to restore the long-term health of the tree canopy. Denver Water and the jurisdictional parks and recreation districts responsible for the Canal’s recreational trail have maintained the trees within their respective areas with emergency removals and small trimming and pruning needs focused on hazardous conditions along the trail. However, in 2016, the Conservancy, Denver Water and leadership from each of the jurisdictions along the Canal’s reach joined together in an unprecedented effort to leverage funding, staff and expertise for all 71 miles of the Canal. The first step in 2016 was a comprehensive tree inventory in which data was collected on 23,539 trees along the Canal by Davey Tree Expert. The data collection project identified, mapped and evaluated all trees with a diameter of six-inches or greater within the Canal corridor, and the results have been used to assess and prioritize actions needed for the tree canopy. Conclusions from the inventory led to immediate and long-term planning to revitalize the tree canopy, initiating the Canal’s Tree Canopy Care Project. Over 40 percent of the tree canopy is made up of cottonwood trees, many over 100 years old and nearing the end of their natural lifespan. This, along with a growing population and limited water source, reinforces the need to act now and plan for the Canal’s changing landscape. Establish and monitor standards for tree removal and pruning that fulfill the Community Vision Plan for the High Line Canal. Coordinate the accounting of each jurisdiction’s investment in the project. Leverage private funding to ensure long-term, high-quality care of the entire tree canopy. Maintain detailed data of the trees and their condition as a tool for long-term management and enhancement. Develop Landscape Design Guidelines, which will establish a long-term plan for tree care, drought-tolerant plantings, maintenance and enhancements. Manage a multi-year tree maintenance program to remove and prune priority trees for safety and the health of the tree canopy. Tree care maintenance will begin in June 2018 and entail a two- to three-year tree removal and pruning program. These immediate first steps prioritize safety for recreational users and the most pressing tree health issues. Trees that pose immediate safety concerns will be removed or, in some cases, partially removed to maintain wildlife habitat. Other top priority trees will be trimmed and pruned for safety and the quality of the tree canopy to extend the life of the trees. This current program, addressing only the highest priority trees, is possible because of joint funding from Denver Water and the jurisdictional partners, as well as private citizens through the Conservancy. This is only the beginning and continued support and funding is necessary for future work. See below for how to get involved and support the Conservancy to help enhance the Canal’s landscape. Ongoing tree care beyond this initial maintenance program will be supported by the creation of landscape design guidelines currently being developed as part of the Framework Plan (learn more at www.highlinecanal.org/framework). These guidelines will provide recommendations for new trees and vegetation, focusing on drought-tolerant and native species, as well as other landscape enhancements. As the varied landscapes of the Canal’s five character zones evolve with changing times of limited water, it’s imperative to focus on drought-tolerant and native species, addressing areas designated for stormwater filtration as well as those with little to no water. The landscape design guidelines will honor the historical and native vegetation along the Canal – dating back to the 1880s – and ensure the community’s vision for the Canal is fulfilled. Denver Botanic Gardens’ research and conservation department has partnered with the Conservancy to survey plant communities along the 71-mile trail. The intensive data collection will occur May through September and assess the plant species within each of the five character zones. Documenting present species and estimating how common they are along different parts of the corridor is critical to understanding the Canal’s ecological functions, including providing wildlife habitats. This information will help inform the landscape design guidelines and future landscape enhancements along the corridor. The Conservancy is committed to working with its partners to ensure continued tree care maintenance is a priority in order to protect a healthy ecosystem and beautiful natural setting along the Canal. This entails implementing standards outlined in the landscape design guidelines as well as continuous tree monitoring, maintenance and funding. Continuous tree care is critical to a healthy tree canopy and ecosystem. Stay involved with the Conservancy to ensure implementation of the landscape design guidelines and uninterrupted tree monitoring and maintenance. Visit highlinecanal.org/tree-care. Canal users can expect to see professional arborists on the Canal beginning in early June. Arborists will work alongside jurisdiction field crews, with oversight support from Denver Water and the Conservancy staff. Under the guidance of Denver Water, one professional crew will begin work in Aurora, working their way south toward Denver. A second crew will focus on the Canal corridor in Douglas County. In addition, some jurisdictions, including Denver and Highlands Ranch, will utilize their in-house specialists to perform tree pruning and removal under the objectives of the tree maintenance program. Your patience is appreciated as there may be brief disruptions or closures along short segments of the trail during this time. For up-to-date updates on closures and detours, visit: www.highlinecanal.org/tree-care. WHEN WILL THE TREE CANOPY CARE PROJECT BEGIN? As of June 2018, work has begun on the care and renewal of the tree canopy. The project will occur over a two- to three-year period beginning in Aurora and Douglas County, moving into all five character zones providing care and maintenance to the highest priority trees along the 71-mile corridor. SOME OF THE TREES ARE MARKED. WHAT DO THE MARKINGS MEAN? Arborists performing work on the Tree Canopy have the location and type of work needed for the trees utilizing GIS technology and a comprehensive data system. Trees that will be addressed will have a painted mark to provide a secondary confirmation to the scope of work that needs to happen on a specific tree. Tree maintenance work which ranges from a removal, to a habitat prune, to a health or safety prune by a contracted arborist. Smaller trees that need attention will be serviced by Denver Water staff. HOW WILL TREE CANOPY CARE AFFECT CANAL USERS? Arborists working along the Canal will do their best to minimize disruptions along the trail while pruning or, in some cases, removing trees. However, in certain areas, there may be trail closures for short periods of time. Stay up to date on potential trail interruptions by checking highlinecanal.org/tree-care or follow the Conservancy on Facebook and Twitter. WHAT IS THE STATUS OF THE COTTONWOOD TREES? Over 40% of the tree canopy is made up of cottonwood trees, many over 100 years old and nearing the end of their natural lifespan. While the cottonwoods are one of the Canal’s most treasured assets, they pose challenges for future re-planting because of their high levels of water consumption and relatively short lifespan. The canopy care project is focused on fostering a healthy and safe tree canopy, as well as extending the life of these aging trees. Ongoing tree care beyond this initial maintenance will be supported by the creation of landscape design guidelines currently being developed as part of the Framework Plan. These guidelines will address the Canal’s changing landscape and provide recommendations for new trees and vegetation, focusing on drought-tolerant and native species. IS ANYONE DOING ANYTHING ABOUT THE RUSSIAN OLIVES ON THE CANAL? Russian Olives are an invasive species that are present in the Canal corridor. As part of the Tree Canopy Care Project and ongoing maintenance, there is an effort to get these removed. WHAT’S HAPPENING WITH THE WOOD FROM THE TREES THAT ARE PRUNED OR REMOVED? Depending on the location and the condition of the wood, there are several things that could happen. It could remain in place as wildlife habitat, it could be mulched and brought to a mulch-yard for use or resale, or it could be brought to a composting facility. Considerations will also be made to re-purpose tree wood for future trail signage, nature play areas, benches and other enhancements along the Canal. I AM CONCERNED ABOUT THE CONDITION OF A TREE ALONG THE HIGH LINE CANAL. WHAT DO I DO? If there is a public safety risk please call Denver Water at (303) 893-2444 during regular business hours, Monday-Friday, 7:30am-5:30pm. After hours emergencies call (303) 628-6801. Staff will determine any appropriate action if needed. Because these trees do not pose a significant safety concern, and the debris is primarily an aesthetic issue, these are lower priority than trees hanging over the trail. Prior to running water through the Canal, Denver Water staff will remove debris in the Canal that could prevent the flow of water. Colorado Law allows a property owner to cut overhanging limbs at their property line. The property owner is responsible for removing any debris resulting from pruning the tree. If a prune at the property line is not sufficient, please call Denver Water at (303) 893-2444 during regular business hours Monday-Friday, 7:30am-5:30pm. Staff will determine any appropriate action needed. WHO DO I CALL IF I AM CONCERNED ABOUT TREES ALONG THE CANAL CORRIDOR? Good reminder & info from our friends at @denverparksrec! Be a High Line Hero. joinhighlinecanal.org and support what you love! Sign up for monthly updates through the High Line Canal newsletter to stay up to date with Canal happenings and opportunities to engage in the planning process. The High Line Canal Conservancy is a tax-exempt nonprofit that was formed in 2014 by a passionate coalition of private citizens to provide leadership and harness the region’s commitment to protecting the future of the High Line Canal. With support from each jurisdiction and in partnership with Denver Water, the Conservancy is connecting stakeholders in support of comprehensive planning to ensure that the Canal is protected and enhanced for future generations.